We offer free counseling in matters of residential issues to all single refugee women* and their children, irrespective of their origin and residence status. We attach great importance to long-term and holistic support, which also includes the children. The counseling is provided by an experienced consultant (female) and can take place anonymously. By prior arrangement, we can organize a person who translates into the mother tongue. If necessary, we connect to other specific counseling centers, lawyers, doctors, etc. On request, we can organize volunteers companions to support in situations such as visits to the authorities or to a doctor. 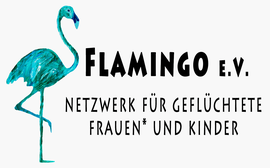 Appointments can be arranged by mail at mail[at]flamingo-berlin.org.